Ten years ago, skiing in Georgia was a well-kept secret known by only a handful of locals and the most adventurous ski vagabonds. This is rapidly changing as the Georgian ski hype spreads throughout Europe and the rest of the world, so it seems about time to write a comprehensive guide to everything you need to know about skiing in Georgia! 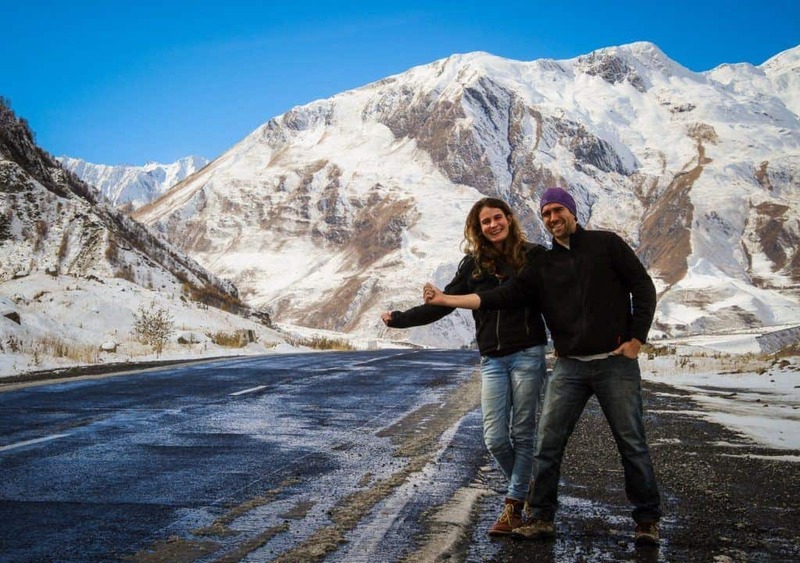 Written by Taylor Beckwith – Ferguson, adventurer, traveler and ski instructor. Though the facilities are not yet at the level of ski areas in the Alps, this comes at a small fraction of the price (€14/day lift tickets), making Georgia suitable for all but the most posh skiers. The ski lifts are a mix of new and old, with new high-speed lifts being added each year. The slopes are groomed overnight to be ready for each new day, though the groomers often seem to miss a spot here and there. Food and drinks on the mountain are nearly the same prices as in town, something unheard of elsewhere in the world (€5 for an enormous meal with mulled wine!). The roads to the ski resorts leave something to be desired, but who goes to a ski resort to drive, anyways?! Rental gear is quickly improving in quality and availability, restaurants have menus in English, and accommodation ranges from backpacker hostels to 4-star hotels. Last year, a new ski school opened in Gudauri, employing native and fluent English-speaking instructors. They can also arrange qualified backcountry guides and plan full ski trips for individuals or groups throughout Georgia. Georgia’s terrain varies from the lower-elevation/higher-precipitation Lesser Caucasus in the southwest to the iconic Greater Caucasus ridge along the northern border with Russia. 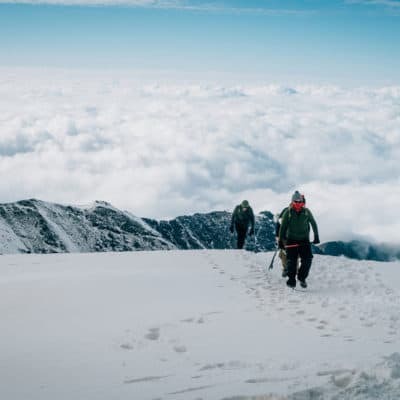 Thanks to their proximity to the Black Sea, the Lesser Caucasus’ receive the most regular snowfall, but their higher-elevation counterparts in the Greater Caucasus have longer seasons, more picturesque peaks, and attract more tourism. Be well-prepared for your trip to Georgia! Read: Everything you need to know about Traveling to Georgia! Though the vast majority of terrain in Georgia is theoretically skiable, there are four main ski resort towns. 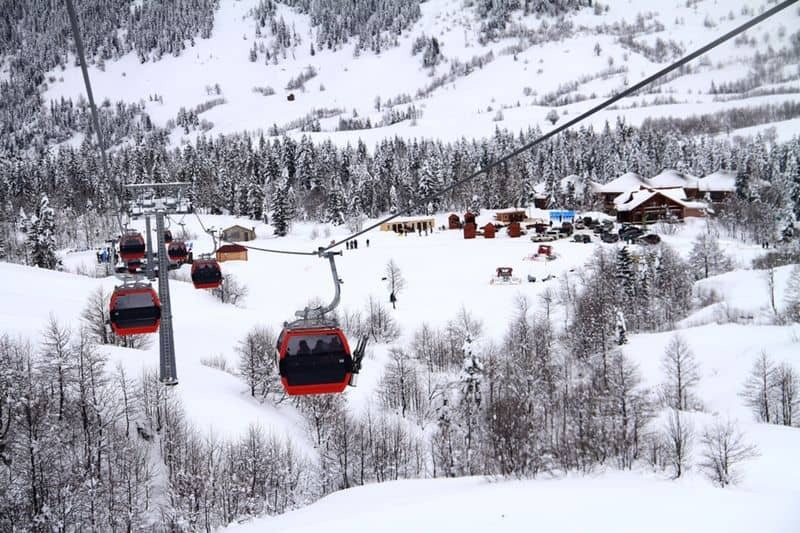 Each resort offers access to ski lifts and groomed pistes, as well as a plethora of backcountry options. 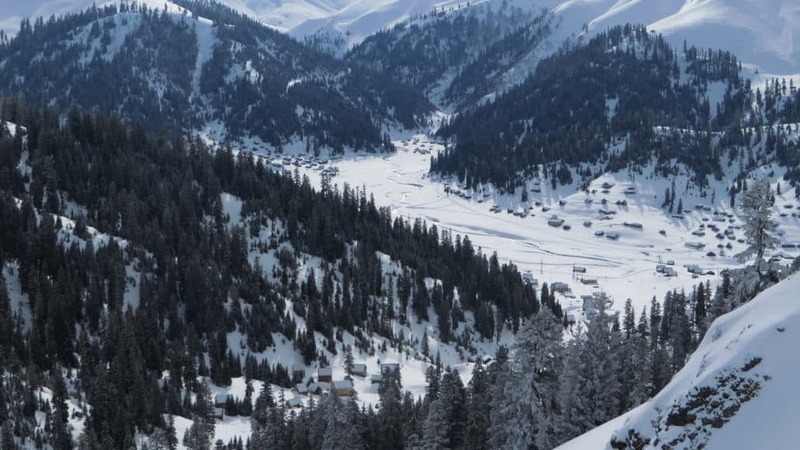 Gudauri is Georgia’s main ski resort, offering a wide range of terrain for all ages and ability levels. It is the most developed ski town and is growing very quickly, with new hotels, restaurants, ski lifts, and activities opening each year. 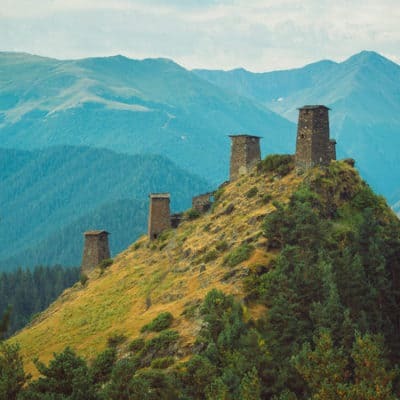 Gudauri is well equipped for families, solo travelers, and friends, and is easily accessible from Tbilisi in only 2 hours by hitchhiking/car/bus. It is the only ski resort with an entirely English-speaking ski school catered to Western travelers and with discounts for hitchhikers. Being the most internationally famous ski resort means that it is also the most expensive, but that doesn’t mean much when compared to the Alps. Food and lift tickets cost essentially the same at all Georgian ski areas; only accommodation is more in Gudauri. Hostels range from €15-30 per night for a dorm bed, but at least that typically includes breakfast and dinner. For groups it can be cheaper to book a hotel room or AirBnB. Wild camping is of course also an option if you’re prepared for cold nights (Get creative! Build an igloo!). The terrain varies from several beginner’s areas to narrow rocky chutes and everything in between. 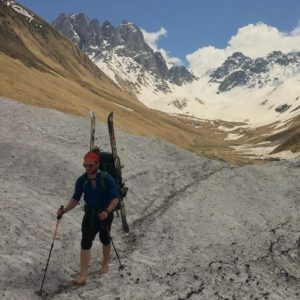 Warmer weather on the lower (and flatter) part of the mountain satisfies beginners, while more extreme conditions on the super-steep peaks satisfy experts. The terrain within the resort is sufficiently interesting for a 4-5 day trip, and expert skiers can happily ski the never-ending backcountry possibilities for years without getting bored. Everything in Gudauri is above tree line and the entire resort is south facing. From the top of the highest lift, a huge area on the backside of the mountain becomes accessible with a 2-30 minute walk. 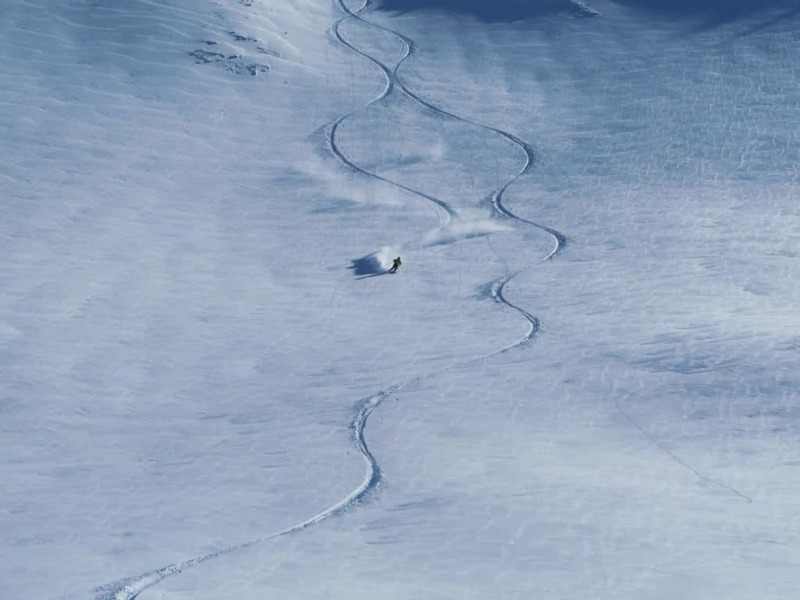 This area can only be skied by those with sufficient avalanche safety training and equipment, or with a guide. Here, fresh tracks can always be found on 1000-meter north-facing descents, ending at the highway where it’s possible to hitchhike or take a taxi back to town. For the more athletic, all up and down the highway between Gudauri and Stepantsminda are valleys perfect for ski touring. 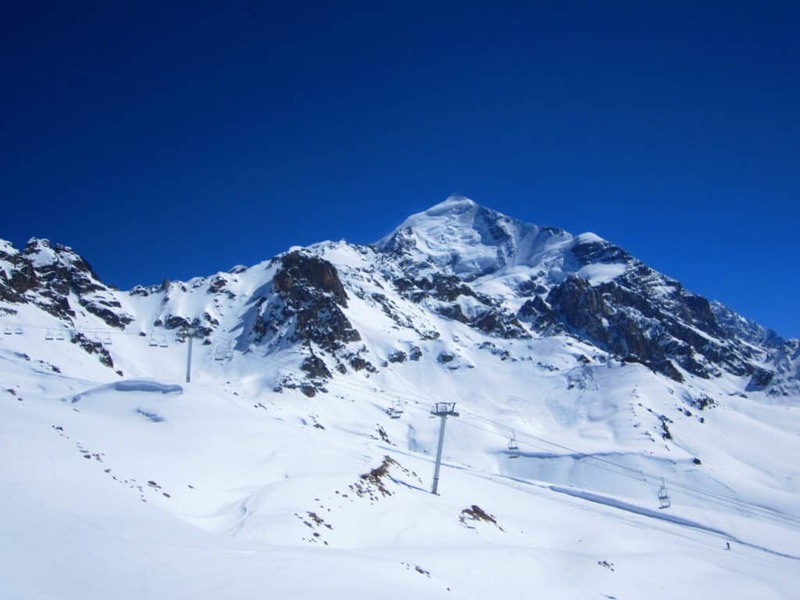 Good snow can be found until June or longer for ambitious ski mountaineers. Mestia is the capital of the Svaneti region, home to Georgia’s Svan minority with a unique language, architecture, and cuisine. It is located near two ski resorts, Hatsvali and Tetnuldi. 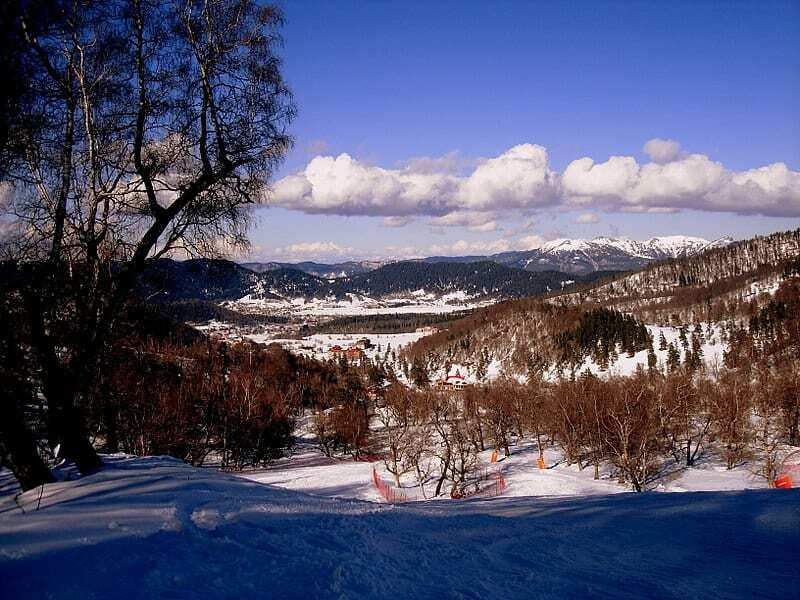 In its current state, skiing in Mestia is better suited for intermediate to expert skiers, as decent English-speaking instructors are hard to find and beginners’ areas are not well developed. A new lift from Mestia to the base of Hatsvali resort was built last winter, but it begins just far enough out of the center that it’s not quite walking distance for most skiers. Tetnuldi is a 45-minute drive from Mestia down a terrible road full of potholes which only high-clearance 4wd vehicles can pass. Mestia itself is accessible by car, marshrutka, or by train + marshrutka via Zugdidi. The road from Zugdidi to Mestia is 130km, but typically takes at least 3 hours thanks to the constant need to clear rock slides and avalanches from the road. Hopefully, this will improve in the future (or maybe it’s better this way – less crowds!). 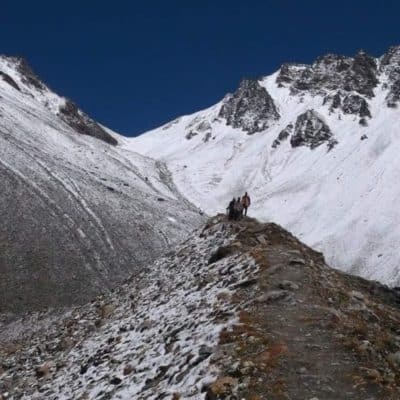 The town is well developed for tourism as it serves as a summer hub for trekking tours and is now becoming a winter destination as well. Hotels and hostels are abundant and prices can be found as low as €4 per night. Restaurants are similarly priced to other ski resorts, but due to its isolation, fruits and vegetables are more expensive. Svan cuisine is even saltier than the rest of Georgia, so make sure to explicitly ask for NO SALT at restaurants; you’re better off adding salt yourself to your own taste! Terrain and snow-wise, Mestia would likely take over Gudauri’s title as the freeriding mecca of Georgia if it weren’t for the difficulty of access. The inbounds terrain is unbelievable on a powder day in both Hatsvali and Tetnuldi. Hatsvali has only one lift which accesses pillowy, densely-forested terrain, and Tetnuldi has 4 lifts all above tree line, accessing some decently steep west- and north-facing terrain. In 2018, the highest two lifts in Tetnuldi were broken for over 1.5 months, which meant that the top half of the mountain was only accessible by hiking – it’s clear that lift maintenance is not a priority there. This isn’t a huge problem, though, as Mestia is most often visited by backcountry skiers. Though lift-accessed sidecountry isn’t as abundant as in Gudauri, there are endless opportunities for ski touring. Ski touring from Mestia itself is only possible in the coldest months of winter, but many higher valleys are accessible within a 1-3 hour drive during springtime. 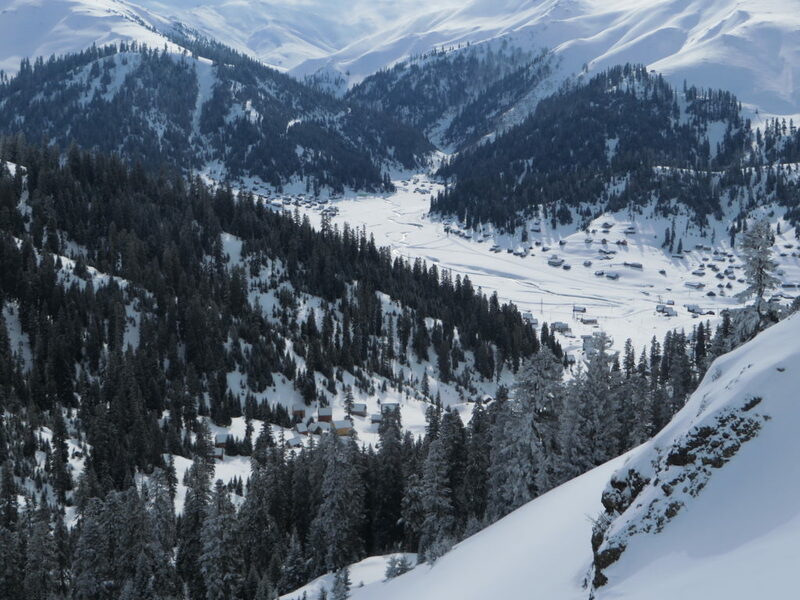 Ushguli, Mazeri, and Adishi are ski touring hotspots, with some primitive guesthouses and single or multi-day ski tour possibilities. 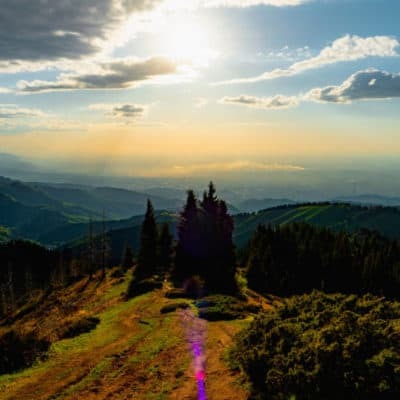 Bakuriani is about 4 hours by car from Tbilisi and mainly consists of beginner-friendly slopes, though there is one lift which accesses much steeper forested terrain. The annual snowfall is lowest here of all of Georgia’s ski resorts, but if you catch it on the right day, it can be a lot of fun for the advanced skier due to the complete lack of crowds. The town has several hotels and restaurants and is easily accessible by train, car, or marshrutka, though the infrastructure is mainly geared towards local tourists and little English is spoken. This, of course, means that prices are a bit lower than the other ski resorts. 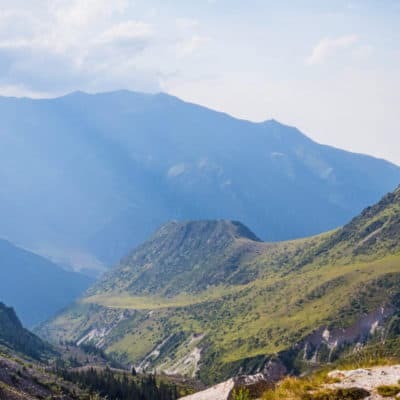 Goderdzi has 1 hotel, 2 lifts, a lot of snow, fairly flat forested terrain, and is located on a terrible road which closes quite often after snow storms and is only drivable with a high-clearance 4wd vehicle. Thanks to this, you’re nearly guaranteed good snow and solitude on the mountain, at least for the next few seasons until the road is improved. In its current state, Goderdzi is best for intermediate free-riders who seek fluffy powder but don’t thrive on steep slopes, and for those who want to combine a day of resort skiing and a day of cat skiing in a very remote region. 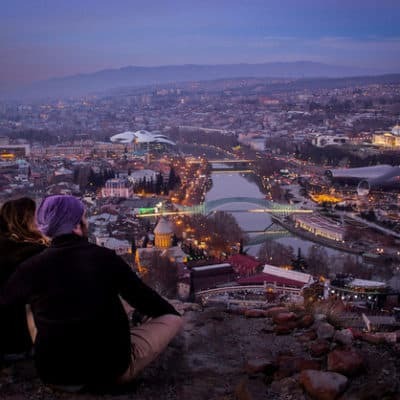 Either bring your own gear or rent it in Tbilisi, because possibilities are scarce here. A cat skiing operation runs out of Goderdzi and will take you up the surrounding mountains, or pick you up when the road is closed. Bakhmaro is a summer resort town that’s only recently begun to develop as a winter destination. 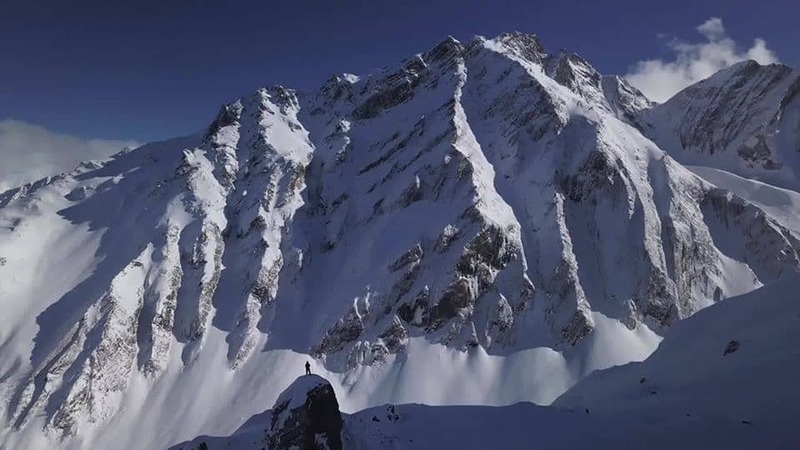 A few years ago, a traveler from Germany discovered the never-ending powder that seems to continuously fall in Bakhmaro and he decided to start a cat skiing operation there. Powderproject.ch is now running week-long all-inclusive cat ski holidays in Bakhmaro, which give skiers a unique opportunity to shred untouched powder, experience the local cuisine, play with the local puppies, and then ski some more powder. 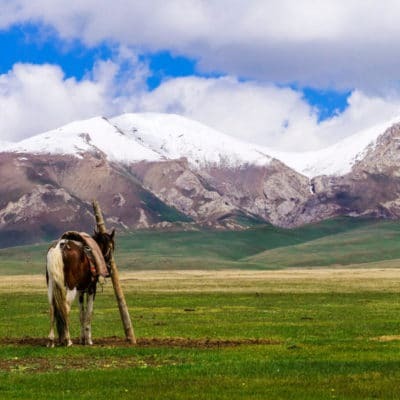 Racha is a very remote region best for multi-day ski touring or mountaineering trips. Most skiers start in the village Ghebi. Very little information is available about this area, but there are a few mountain guides familiar with the terrain. This is a good place to go if you want to make a first descent. 10 dishes from the Georgian cuisine you absolutely have to try! Backpacking in Georgia on a budget – How much does it cost to travel and live in Georgia (the country)? Throughout the last 3 seasons in Gudauri, Taylor has watched as dozens of new hotels pop up, new restaurants open, new lifts are built, empty slopes fill with crowds on holiday weekends, and the predominant language is beginning to shift away from Russian and towards English. He began as a ski instructor scraping by with a few hours of work per week, but as the hype spread throughout Europe and Dubai, demand grew, and he opened Georgia’s first ski school to specialize in lessons in English. My girlfriend and I are in Kiev and trying to throw together 3 days of touring before April 13th! We will have to rent stuff and get a guide. Can you suggest between one of three spots: HATSVALI AND TETNULDI and Gudauri? My girlfriend speaks Russian and Ukrainian. Thank you!! If you’re planning on doing some skiing, then I would recommend Gudauri. It’s easy there to rent gear and/or get a guide! Thank you for this fantastic guide! Hi Deepa, your kids (and you) will love your time in Gudauri! There are fun activities you can do there with your kids. I’d definitely recommend snow tubing and building a snowman ;). There are also a lot of professional ski teachers. 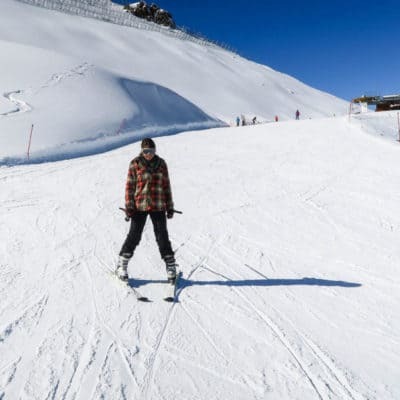 It could be fun for your children to take a day of skiing classes. I wish you a great time in Gudauri and Georgia! hi i really want to ski georgia this coming year but with a torn MCL I’m restricted to on piste groomers where do you recommend? Hi Roger, I’d recommend the ski pistes in Gudauri! I was planning to go on a ski holiday this year with my family and wanted to give a surprise to my husband by renting out chalet to stay as he always loves to stay in such a beautiful chalet. And I must say this is really great as well as helpful info for me. Thanks for sharing. Hi Claire, oh, this is so nice to hear!! I’m very happy that this guide has been so helpful to you! I’m wishing you a beautiful time with your family in the chalet and enjoy your ski holiday this year!